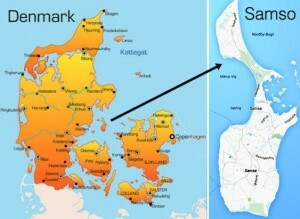 Samsø municipality is preparing the ground to build a biogas plant to ensure the necessary gas supply for the ferry line connecting the island to the mainland. Environmental permits and work plans have already been approved: dialogue with potential investors is still ongoing. Figure 1 – Samsø Island. 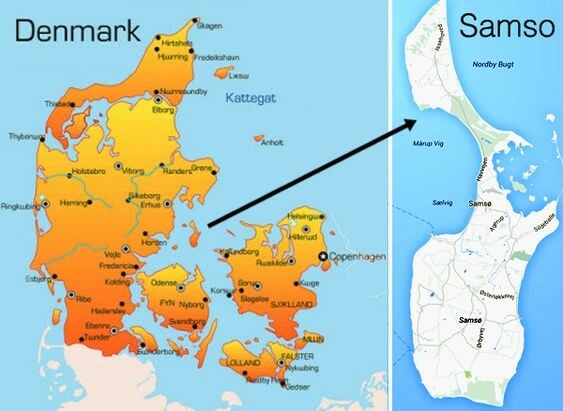 The Island of Samsø is mainly known for the early potatoes and other high- quality vegetables at national level, while it is internationally renowned as the “Renewable Energy Island” with the ambitious goal to eradicate the use of fossil fuels for the ferries. In that context, the implementation of a biogas plant project is crucial for the agricultural sector and renewable energy targets. The expected biogas production, accordingly to the available biomass resources on the island, will cover the annual energy needs of the Ferry Prinsesse Isabella (30 GWh). This will reduce CO2 emissions by 13,000 tonnes per year.Biogas production implies an anaerobic digestion which produces a mixture of gases and a digestate that can be used as fertilizer. Although gas is usually the main product by virtue of feed-in tariffs for power generation, in Samsø, the recycling potential thanks to digestate would have a strong impact on agriculture and society in terms of innovation. “It stays on the Island” is the buzzword for circular economy activities in Samsø: we must recycle both agricultural and urban waste to free ourselves from fossil sources. Therefore, Samsø Biogas does not only represent a source of liquefied bio-gas for Prinsesse Isabella ferry, but also a matter of interest for farming community on handling residues for different crops and purposes. Some crops grown in Samsø Island. 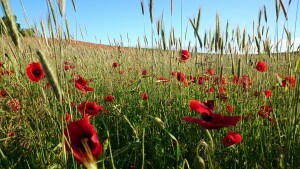 • one third is solid biomass side streams from urban and farming activities. Some urban waste is subject to specific restrictions resulting from Danish legislation that limits its use on food crops. Farmers are very much aware of this regulation and they are extremely careful about maintaining the high-quality level of their products. The concept of circular economy has led to an interest towards recycling organic waste such as household litter, organic fraction of sewage, disposed vegetables from restaurants and shops. 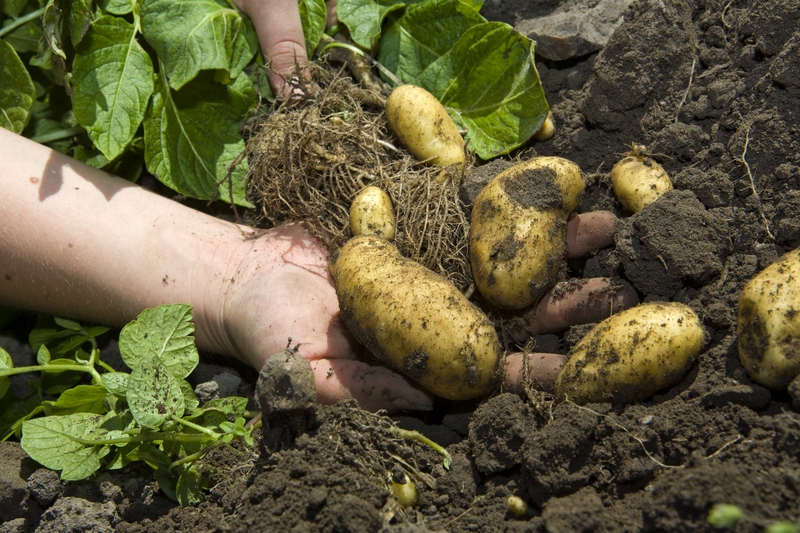 However, some farmers are reluctant to use potato and onion waste for biogas because of the potential spreading of crop-specific fungal diseases. Instead, most farmers are aware of digestate value in terms of fertilizer: raw agricultural waste such as manure can be readily used for all types of crop. In addition, we must consider that Samsø is one of the driest places in Denmark, and that intensive crop production requires an amount of irrigation which is jeopardizing the scarce groundwater resources. Moreover, treating sewage water in Wastewater Treatment Plant generates nitrogen evaporation as well as phosphorous sedimentation, and therefore, may potentially cause eutrophication. Given such circumstances, water and nutrients should be recirculated through a new treatment depending on ultrafiltration of raw sewage. By means of it, sewage water could be used for fertilization while the organic fraction could go into the biogas plant, producing both energy and fertilizer. Because of the above-mentioned risks, farmers were originally sceptical about whether all inputs could be mixed in one digester or not. To avoid any complication, it was decided for two separate lines (Figure 2). Figure 2 – Samsø Biogas double-loop biogas digestate. • The Yellow line is designed for food industry sewage, vegetables leftovers, scraps of food, organic household garbage, restaurant and shop waste and ultimately the organic fraction of general sewage. The digestate from this mix can be used to fertilize abundant grass seed fields since it does not require high nitrogen loads. After theharvest, remaining straw may be used too. 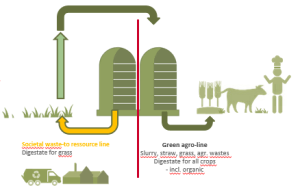 • The Green Line is intended for agricultural waste such as live-stock manure and straw: as a result, it produces a digestate to fertilize all types of crops which could even be used by organic farms. This innovative double-loop mechanism that differentiates between urban and agricultural waste can produce different types of fertilizer for many varieties of crops: while recycling all waste from society it ensures a high-quality food production. Indeed, the possibility of creating fertilizer for organic producers makes this concept much more valuable in an island context with relatively low livestock density. Furthermore, farmers cultivating potatoes and other vegetables complained for the progressive soil carbon depletion due to intensive soil tillage. It is currently being analysed whether a post digestion separation of the digestate could give a valuable fibre fraction to be used strategically for such types of soil. We are establishing values of balance for carbon in order to estimate sources and we are determining the carbon basins being required by three different cases of specialised farmers. Moreover, we are questioning if soil carbon level can be improved by post-digestate fibres high in slowly degradable carbon source (lignin). 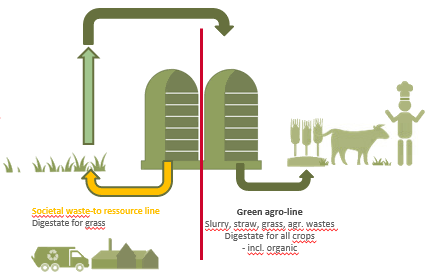 However, more work on the double loop concept is needed to balance the two lines and, most importantly, to convince all farmers of the quality of fertilizers so that the biogas plant may integrate carbon, water and nutrients. The Renewable Energy Directive, which is being negotiated in Brussels these months, is another important piece to the realization of this project as it could compensate for the additional costs of this innovative biogas plant. This article is by Knud Tybirk, Samsø Municipality, and Giovanna de Carvalho Quinta, Aarhus University.